The EDS-505A are standalone 5port managed Ethernet switches. 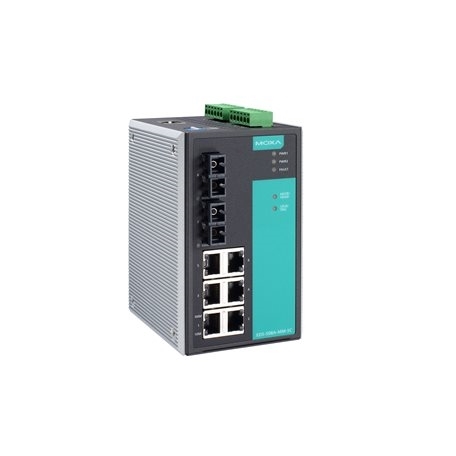 With their advanced Turbo Ring technology (recovery time < 20 ms) and RSTP/STP (IEEE 802.1w/D), the EDS-505A/508A switches increase the reliability and availability of your industrial Ethernet network. 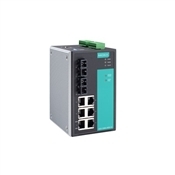 Models with an wide operating temperature range of -40 to 75°C are also available, and the switches support several reliable and intelligent functions, including QoS, IGMP snooping/GMRP, VLAN, Port Trunking, SNMPv1/v2c/v3, IEEE 802.1X, HTTPS, SSH, and RMON, making the EDS-505A/508A switches suitable for any harsh industrial environment. Digital Inputs 2 inputs with the same ground, but electrically isolated from the electronics.